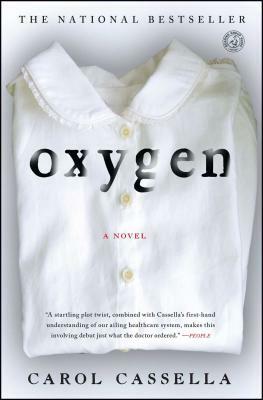 Oxygen (Paperback) | Eagle Harbor Book Co.
With the compassion of Jodi Picoult and the medical realism of Atul Gawande, real-life anesthesiologist Carol Cassella's riveting national bestseller seamlessly melds compelling women's fiction and medical drama to create an "involving debut that's just what the doctor ordered" (People). Dr. Marie Heaton is an anesthesiologist at the height of her profession. She has worked, lived, and breathed her career since medical school, and she now practices at a top Seattle hospital. Marie has carefully constructed and constricted her life according to empirical truths, to the science and art of medicine. But when her tried-and-true formula suddenly deserts her during a routine surgery, she must explain the nightmarish operating room disaster and face the resulting malpractice suit. Marie's best friend, colleague, and former lover, Dr. Joe Hillary, becomes her closest confidante as she twists through depositions, accusations and a remorseful preoccupation with the mother of the patient in question. As she struggles to salvage her career and reputation, Marie must face hard truths about the path she's chosen, the bridges she's burned, and the colleagues and superiors she's mistaken for friends. A quieter crisis is simultaneously unfolding within Marie's family. Her aging father is losing his sight and approaching an awkward dependency on Marie and her sister, Lori. But Lori has taken a more traditional path than Marie and is busy raising a family. Although Marie has been estranged from her Texas roots for decades, the ultimate responsibility for their father's care is falling on her. Carol Cassella majored in English Literature at Duke University and graduated from medical school in 1986. She currently practices anesthesia in Seattle and is a freelance medical writer specializing in global public health advocacy for the developing world. She lives in Bainbridge Island, Washington, with her husband and their two sets of twins.